where r is the raidus of the circle. But the question gives us only the distance from the centre of the chord to the centre of the arc. Let this length be l.
Lets assume the arc is formed by the two radii with an angle θ. Let the distance from the centre of the circle to centre of the chord be x. 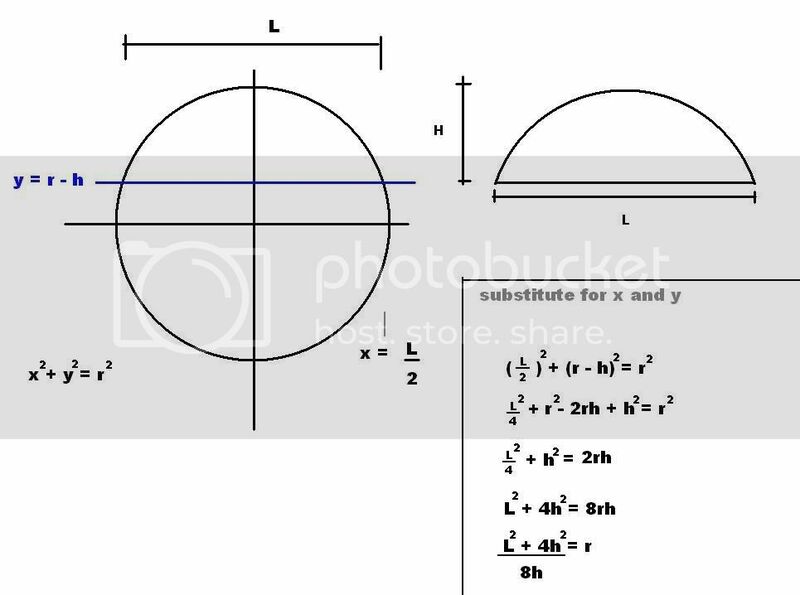 Let the arc cut the circle at points X and Y and O be the Centre. Let the Centre of the chord be M and centre of the Arc be N.
An isoceles traingle XOY is formed. You get two equations with two variables, r and θ. The simultaneous equations can be solved and r and θ can be found. The arc length is given in the problem. where l is the distance from centre of chord to centre of arch. This is given in the problem. You simpy determine the intersection of the line y = r - h and x = L/2, substitue these values and rearranged. I was pleased to find the r^2 term is eliminated. And of course this formula can be rearanged to solve for either L or H if the two remaining values are known. I needed this to find the focal length of a spherical reflector I got, so I worked out this formula to solve it for me. Worked perfectly!